Gluconacetobacter xylinus (formerly Acetobacter xylinum and presently Komagataeibacter medellinensis) is known to produce cellulose as a stable pellicle. However, it is also well known to lose this ability very easily. We investigated the on and off mechanisms of cellulose producibility in two independent cellulose-producing strains, R1 and R2. Both these strains were isolated through a repetitive static culture of a non-cellulose-producing K. medellinensis NBRC 3288 parental strain. Two cellulose synthase operons, types I and II, of this strain are truncated by the frameshift mutation in the bcsBI gene and transposon insertion in the bcsCII gene, respectively. The draft genome sequencing of R1 and R2 strains revealed that in both strains the bcsBI gene was restored by deletion of a nucleotide in its C-rich region. This result suggests that the mutations in the bcsBI gene are responsible for the on and off mechanism of cellulose producibility. 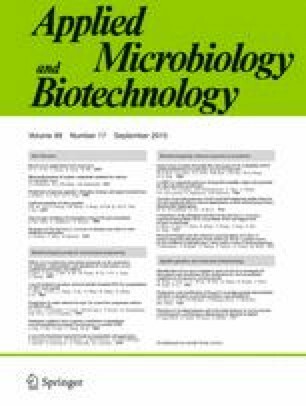 When we looked at the genomic DNA sequences of other Komagataeibacter species, several non-cellulose-producing strains were found to contain similar defects in the type I and/or type II cellulose synthase operons. Furthermore, the phylogenetic relationship among cellulose synthase genes conserved in other bacterial species was analyzed. We observed that the cellulose genes in the Komagataeibacter shared sequence similarities with the γ-proteobacterial species but not with the α-proteobacteria and that the type I and type II operons could be diverged from a same ancestor in Komagataeibacter. Minenosuke Matsutani and Kohei Ito contributed equally to this work. The online version of this article (doi: 10.1007/s00253-015-6598-x) contains supplementary material, which is available to authorized users. We thank Haruo Suzuki (Yamaguchi University) for his skillful technical assistance in phylogenetic analyses. This work was financially supported by the Advanced Low Carbon Technology Research and Development Program (ALCA).